Illinois is often used as the poster child for how not to run a state. Money-hungry politicians perpetuate the state’s spending problem with higher taxes and more borrowing. Meanwhile, the state’s tax base continues to erode as tapped-out families and businesses move to states with more opportunities and friendlier business environments. Illinois’ debt has grown so quickly in recent years that the state now has some of the highest debt levels in the nation. 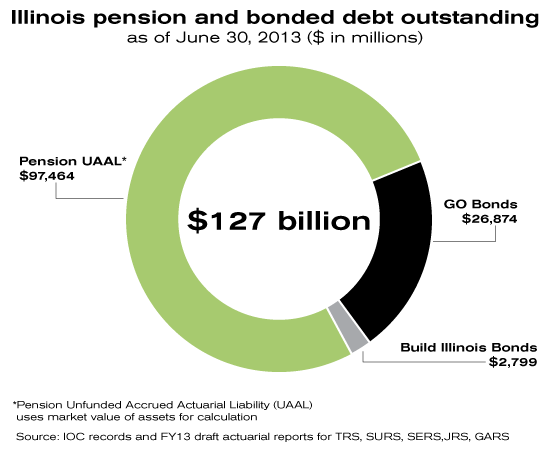 Illinois’ pension and other bonded debt exceeded $127 billion at the end of fiscal year 2013. Pensions are the single largest driver of that debt burden. Illinois closed the last fiscal year with $97.5 billion in unfunded pension liabilities. And pension bonds made up more than $14 billion of the state’s nearly $27 billion in general obligation bonded debt. To put those numbers into perspective, Illinois had just $7.6 billion in general obligations bonds at the close of fiscal year 2002 and its unfunded pension liability hovered around $35 billion. But rapid growth in unfunded liabilities and three very large rounds of pension borrowing caused those numbers to skyrocket. Pension bond debt service is a significant burden on the current budget. Debt service on the three previously mentioned pension bond issues will exceed $1.6 billion in fiscal year 2014. Borrowing at this pace means more money is spent on interest payments instead of core government services. Until the state stops borrowing to pay for pensions and starts passing meaningful pension reform, Illinois’ budget will continue to suffer and taxpayers will continue to leave.